Doll manufacturers were constantly experimenting with materials in an attempt to replace bisque china which so easily was broken. Various substances were tried including wood, celluloid, fabric, metal and a mixture of glue, sawdust and rags called composition. When plastic was invented it seemed that the search was over – here was a product which was not only virtually unbreakable, but was light to handle and could even be washed. In the late 1940s dolls made from hard plastic flooded the UK market. Companies such as Pedigree, Roddy, Palitoy, Chiltern, Rosebud and BND created all manner of lovely dolls from this new wonder product, while, in the US, Madame Alexander, Effanbee, Arranbee, Ideal, Mattel and Vogue did likewise. A further breakthrough came when vinyl was developed. Now dolls were soft to hold and could have hair rooted directly into their heads, instead of wearing glued-on wigs. 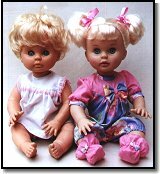 By the 1970s, dollmaking in Britain reached its zenith and shops were filled with the classic dolls we’ve all come to love – First Love, Tiny Tears, Katie Kopycat, Tippy Tumbles, Amanda Jane, Babykins, Sweet April, Victoria Rose, Baby Needs You, Baby Won’t Let Go and Sasha. American dolls poured in, amongst them the innovative Cabbage Patch which caused long queues to form outside toyshops in the 1980s. Continental dolls such as those made by Gotz, Jesmar and Zapf came too. Today, most of the British companies have disappeared or been integrated into other concerns. Zapf’s Baby Born is one of the top-selling dolls, while Playmates’ Amazing Amy and Famosa’s Baby Expressions will surely be future collectables. Dolls are becoming even more lifelike as artists create breathtakingly-beautiful high-quality vinyl dolls which rival the finest porcelain, and already collectors are seeking out playdolls from the 1940s, 50s, 60s, 70s and 80s. They are the antiques of tomorrow!